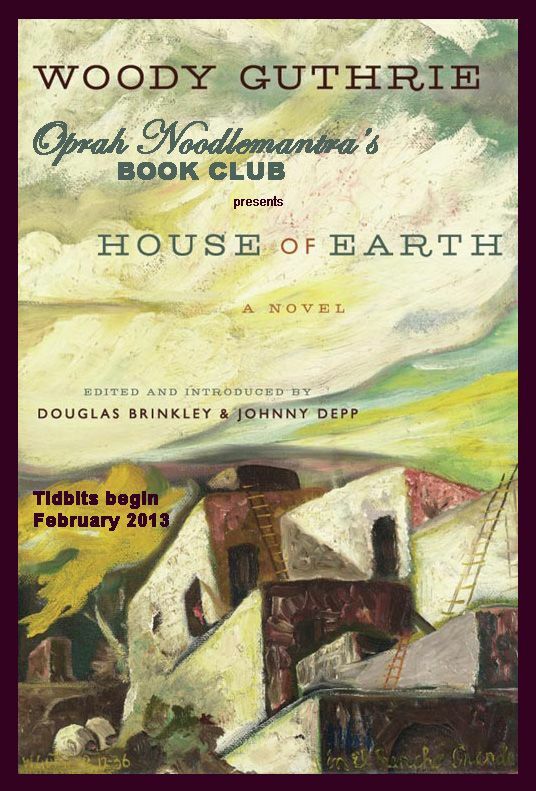 ONBC’s next literary selection is…..
HOUSE OF EARTH by Woody Guthrie (edited and introduced by Douglas Brinkley & Johnny Depp). The year 2012 marked the 100 year anniversary of folk musician Woody Guthrie’s birth. Yes, we know him best for his songs. Who hasn’t sung “This Land Is Your Land?” In addition to penning over a thousand songs, Woody kept diaries and journals, wrote letters, drew cartoons, and even painted watercolor sketches. More on this in February. Also of note, House of Earth is the first book to carry the Infinitum Nihil’s imprint. Thanks to Firefly’s persistence, she and I were lucky enough to snag advance copies from HarperCollins for our review. This means that tidbits will begin in early February, while you are reading your copies. Its release date is February 5. So we encourage you to pre-order your copy. We hope you will join us for this discussion, which will begin in early March. The tidbits for this book are going to be simply awesome...I just know it! I noticed Amazon UK only do the Kindle version. I don't have one, so hopefully they will make a hard copy of this book available soon. I don't understand! I just looked and they've got the hardback at £9.59, being only £1.60 more than the kindle version + an audio CD "by Woody Guthrie, Johnny Depp and Douglas Brinkley" at £23.45. Have another go Pixie! Thank you Pizarros Pies and GG, that's great news! Not sure how I missed that, unless Amazon UK added the hardback since I last looked (just after Liz's post last night). I just pre-ordered my copy at Amazon.com! I combined it with Mark Salisbury's visual companion for Dark Shadows in order to get free shipping, so my book won't arrive as quickly as it might; on the other hand, I should have it well before the discussion starts. I am glad we are supporting Johnny's imprint adventure! Lovely to see people lining up to get the book. I've just started my advance copy and I am not even going provide one, single, solitary hint: buy the book! I will say it's a good read. And yes, Theresa, this one promises some great tidbits. I've already got my nose stuck in too many books researching things. Ah, I am in heaven. Oh, I am so going to be "here" for this one. Well, going to make a concerted effort this time, anyway. So I am guessing it would have been a benefit to see the Dust Bowl programs that were on PBS recently? I missed them, but may have to see if there is a way to download them to my Kindle.